I am really stunned that there seems to be no way that doesn't take multiple steps to rotate a pdf in Evernote. I have tried opening, rotating and saving in Preview, as I used to be able to do, but now it only says that I have to save a copy somewhere, and then I have to drag it back into Evernote. Is there really no easier way to do this? What do you mean by rotating PDFs? On Windows, since Evernote doesn't have a PDF editor of its own, you'll typically need to rely on a 3rd-party editor to do that. - Create the note, for example via scanning from the ix500 directly into EN windows. There may be some pages not oriented correctly, there may be some rear pages filled with junk, whatever. Check if you really have to clean up the Clutter. If the pdf is for documentation purposes only, why not leave it as it is. The search will find it anyhow, and do you really want to invest a chunk of your lifetime into reworking the informational entropy ? - Sync into the EN cloud. - Open the note in the iOS app. Load the pdf attachment. Open via „share“ in PDF Expert. - Edit the pdf there (supereasy on any iPad with pencil support), save it into pdf Expert. - Select the saved pdf there and create a new note in EN on the iPad by sharing it to EN. - Sync, delete the original note with the mistakes, sync again. Yes, it seems like many steps. But because pdf Expert is such a nice app to handle PDFs, I prefer it over trying to do the same on my Win-10-machine. And I am most likely faster even when I switch platforms in between. I use Evernote on my Mac and iPhone. This happens when I scan a document into Evernote using ScanSnap which is supposed to auto rotate, but doesn't always do it. I know that with images, you can rotate them within the Evernote app and they save directly in Evernote. My issue is that I am scanning pages of personal letters for archival purposes, but also to be able to share them with family members to read them, so it does matter if one of the pages is upside down or sideways and therefore quite difficult to read. Pink Elephant - is PDF Expert an app for IOS? I am really stunned that there seems to be no way that doesn't take multiple steps to rotate a pdf in Evernote. I have tried opening, rotating and saving in Preview, as I used to be able to do, but now it only says that I have to save a copy somewhere, and then I have to drag it back into Evernote. I guess I need to submit a feature request for this to Evernote. I appreciate it's not for everyone, but my take on the above is always to scan to (Windows) folder. 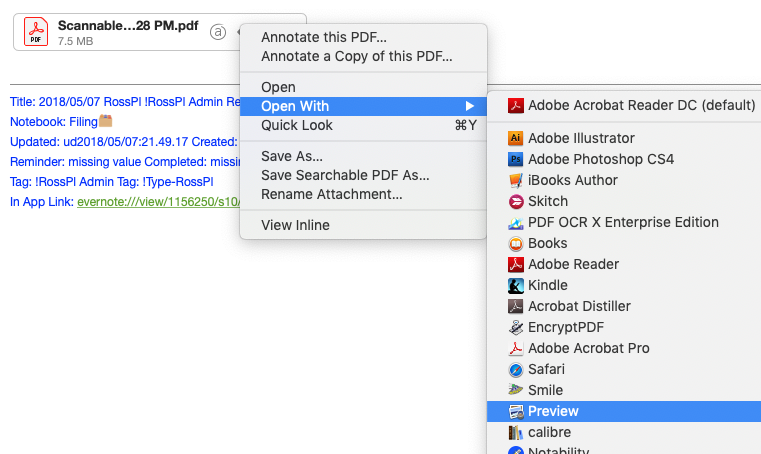 Then I can rename and OCR/ edit files using Acrobat and transfer them to Evernote in one batch. Rotating (if necessary) and straightening are part of standard OCR.